How do I pin a discussion in a course? 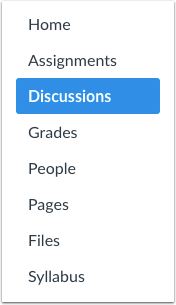 You can pin discussions so students will see them at the top of the Discussions index page. Such discussions could include short-run discussions, discussions that only run for a single week, and any other discussions that students should specifically pay attention to. You can also pin discussions within student groups. If you pin several discussions to the Pinned Discussion section, you can move or reorder discussions within the section. Note: Students do not see the Pinned Discussions section when the page does not include pinned discussions. Locate the discussion and click the Options icon , then click the Pin link . You can also drag a discussion to the Pinned Discussions section. View the pinned discussion in the Pinned Discussions section. To unpin a discussion, locate the discussion and click the Options icon , then click the Unpin link . You can also drag the discussion to the Discussions section. Previous Topic:How do I like a reply in a course discussion as an instructor? Next Topic:How do I subscribe to a discussion as an instructor? Table of Contents > Discussions > How do I pin a discussion in a course?